The Villa Verte is the perfect retreat for peace and tranquility every holiday seeker deserves. Enjoy the laidback lifestyle of island living with the self-catering Villa Verte. Located on the north eastern corner of the stunning La Digue Island, the Villa Verte is designed by a renowned local artist. Set in lush tropical vegetation, the vibrant and colorful designed of the Villa Verte truly reflects the beauty of the island. The open style of the villa creates an unparalleled combination of freedom and comfort where you can feel at one with the lush greenery of the Seychelles. To get to the Villa Verte, you will have to take a flight from Mahé Island to Praslin Island and from there you will to take a ferry to La Digue Island, where the Villa is just few minutes away. Please note that check in is 15hr00 and check out is at noon. The third largest inhabited island of the Seychelles, La Digue Island is among the most desired island of the world by holiday seekers. This dream destination boasts out world’s famous beaches and lush greenery that will leave you speechless. In terms of size, La Digue Island is the fourth largest granitic island of the archipelago, it measures 10.08 square meters. Considering its small size, the best way to commute around the island remains by foot or bicycle. If you want to escape the hustle and bustle of the city, then La Digue Island is the best refuge for you. All while combining the elegance and beauty of the island, the well-known local artist George Camille has kept in mind the space needed by families and friends alike. 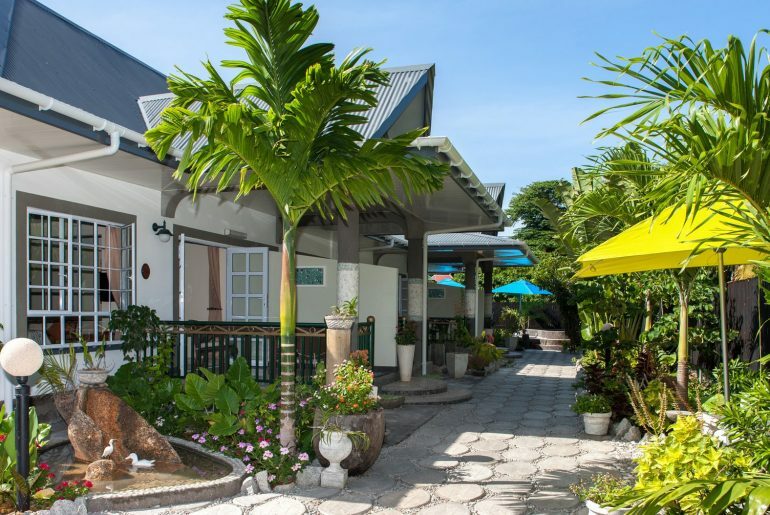 This unique mixture has given birth to one of the most pleasing and comfortable accommodation of La Digue Island. Set amidst lush tropical gardens, one can feel the daily stress fading away all while contemplating the stunning ocean views. The villa at the Villa Verte are of 200 square meters and can easily accommodate up to 8 persons. The interior of the villa has been beautifully decorated with a mix of materials and shapes evoking a real sense of well-being. The expressive colour-scheme blends sublimely with the tasteful wooden floors of the villas. The villa interior displays many of the local artist’s paintings and this certainly adds up the charm of the villa. The spacious veranda runs along the first floor of the house, you can comfortably enjoy the fantastic ocean views and nearby islands from there, all while enjoying your drinks. For the convenience of the guests, the house is service twice a week and this includes linens. La Digue Island invites you to discover its rich maritime flora and fauna. The Island boasts many interesting diving site that features a plethora of species notably butterfly fish, eagle rays, murray eels, blacktips sharks, whale sharks and green sea turtles coming all the way from Aldabra Island to enhance your diving experience. This is no wonder why scuba divers loves the Seychelles! Scuba diving remains among the must do activity in the Seychelles. The Seychelles remains as one of the best kite surfing destination in the Indian Ocean. With its ideal climatic conditions, the Seychelles promised unforgettable kitesurfing experiences. Bringing an excellent array of excitement among kite surfers, La Digue can be described as the best kite surfing spot of the Seychelles. Along perfect weather conditions, La Digue offers kite surfers with the best in terms of scenery. This answers the question why kite surfers keeps visiting the Seychelles. Open from Monday to Sunday at 12pm to 4pm and 7.30 pm to 9.30 pm, the Combava Restaurant is located on the roof terrace of the Domaine de l’Orangeraie hotel. it offers meals ranging from international delicacies to Creole specialties. Anse Source d’Argent is probably the beach you were dreaming of all while choosing the Seychelles as your holiday destination. A visit to the Seychelles without spending some time on the iconic Anse Source d’Argent beach is like leaving half of the Seychelles’ heavenly beauty behind. 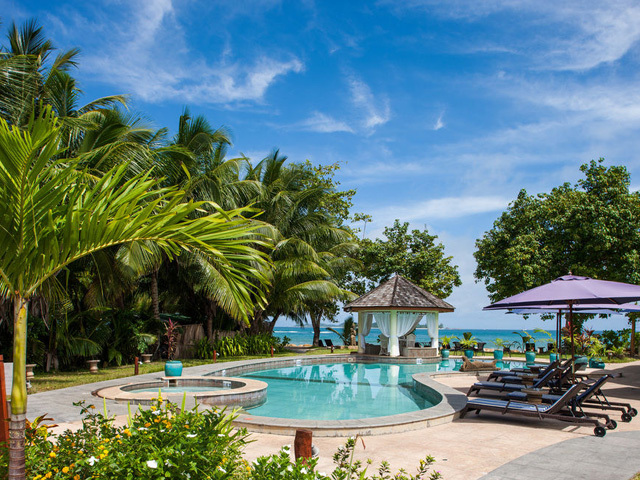 It is important to know that Anse Source d’Argent is not merely just a beautiful beach, but instead is for many the best reflection of the idyllic beach destination. With its emerald waters, golden sand and giant granite formations, Anse Source d’Argentwill keep you spellbound. It is not surprising if you find Anse Source d’Argent to be familiar, as it did appear in many films, magazines and brochures. Undoubtedly, this tremendous beach is among the top 10 most beautiful beaches of the world. The L’union Estates is the ideal place for those wondering how life was some 100 years ago. The estates displays an amazing population of giant tortoises. Do take a tour around the copra mill and the remarkable Plantation house. The area is naturally fill with imposing granite formation as background. The Veuve reserve was officially opened in 1982 following a serious downfall in the number of the Seychelles Black Paradise Flycatcher in 1960. Since then the main of the reserve is to protect and monito the birds and their nests. Fortunately, with the decreased in human intervention, the number of 0these rare birds have begun to increase through time. The Veuve Reserve is not only for bird lovers, it comprises of a thick jungle, where bodanmyen and takamakatrees prevails and the reveals more of the island’s inspiring flora and fauna.